Prior to joining NUI Galway, Lorraine worked as a lecturer and researcher with the Computer Science and Information Systems Department and Lero at the University of Limerick and the School of Business, Maynooth University. Lorraine currently lectures in business information systems in the School of Business & Economics and is a researcher with Lero at NUI Galway. Her principal teaching and research interests are open innovation, open business models, value networks, agile methods, cloud computing, inner source and open source software. Over the past number of years, Lorraine has also been involved in various project consortia attracting over 20m in funding. 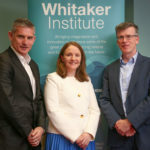 In addition, she is co-leading a project, funded by Science Foundation Ireland, that is part of an industry-focused network of excellence around agile and lean systems development and open innovation. Lorraine is President-Elect of the Association for Information Systems Special Interest Group on Open Research and Practice (SIGOPEN), the largest founding AIS group. She is also General Chair for the Open Symposium on Open Collaboration (OpenSym 2017) and has served as Organizing Chair and Local Committee Chair for a number of international conferences including LESS 2013, the 11th International Conference on Product Focused Software Development and Process Improvement (PROFES 2010), the International Federation for Information Processing Working Conference (IFIP) 8.6 and 8.2, XP 2008 Conference and the Third International Conference on Open Source Systems. In addition, some of her research, one of which received a best paper award, has been published in journals and conferences such as the European Journal of Information Systems, Information Systems Journal (ISJ), Journal of Strategic Information Systems (JSIS), Database for Advances in Information Systems, Information and Software Technology, IEEE Computer, International Conference of Information Systems (ICIS), European Conference of Information Systems (ECIS), International Federation for Information Processing (IFIP) Working Conference 8.6 and 8.2 and the International Open Source Systems Conference. Lorraine has reviewed for journals and conferences such as the Journal of the Association for Information Systems, the Database for Advances in Information Systems, Information and Software Technology, the Americas Conference in Information Systems and the European Conference in Information Systems. (2013) Lean Enterprise Software and Systems. (2008) Agile Processes in Software Engineering and Extreme Programming. (2015) HOW MUCH DO WE KNOW ABOUT THE CONTRIBUTORS TO VOLUNTEERED GEOGRAPHIC INFORMATION AND CITIZEN SCIENCE PROJECTS? (2010) Exploring the Role of Value Networks for Software Innovation. (2015) Strategizing Cloud Service Provision: Deciphering the Business Model. (2010) Opening Up the Agile Innovation Process. (2015) ECIS 2014 Doctoral Consortium: Elucidating the Impact of Cloud Computing on IT Service Providers Business Models. (2015) Deciphering the Antecedents to IT Governance Effectiveness: A Living Laboratory Perspective. (2014) Smart City as a Service (SCaaS): Catalysing E-Government Smart City Development with Cloud Computing. (2014) A Panorama of Cloud Computing Business Models: Towards a Unified Framework. (2013) Value Creation in the Cloud: Understanding the Business Model Factors Affecting Value of Cloud Computing. (2010) Open Source as Open Innovation: Creating and Capturing Value in Value Networks. (2010) Value Creation and Capture with Open Source Software: A Theoretical Model for Understanding the Role of Value Networks. (2010) Enabling Open Innovation through Agile Development. (2008) Value Creation and Value Capture with Open Source Software.